BEWARE. **VERY** STRONG MATERIAL. Not for the easily offended. 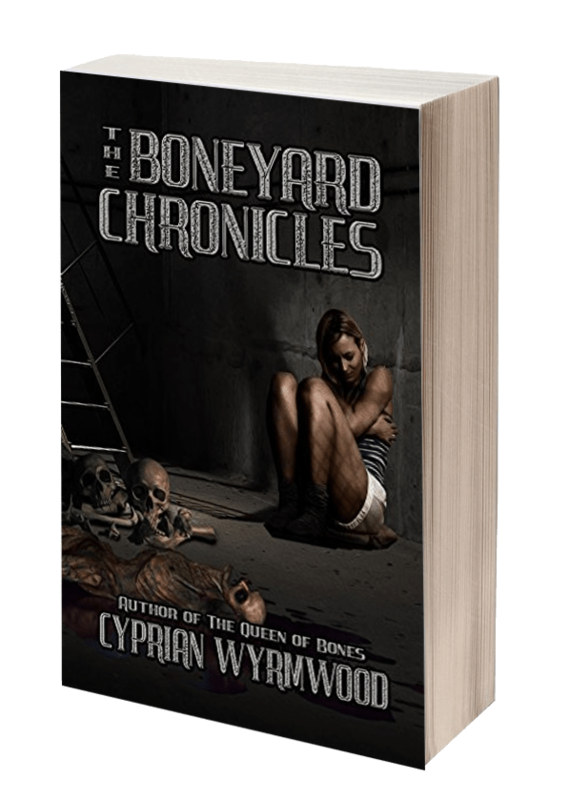 “The Boneyard Chronicles” by Cyprian Wyrmwood is one the most impressive books I have read. In a good way, a very good way. When I took the book, I didn’t expect what I found. The beginning is amazing, a flash introduction to what you’re going to be drowned by, followed by a horror tale you won’t be able to put down. The story grows in suspense and “nightmare” as Wyrmwood whispers the events in the bottom of your mind. The author tricks you, makes you think you’re diving in one dimension but it’s all just… an illusion. This book… soaks you in a grey/spine-chilling/terrifying feeling you can’t escape from. He plays with two kinds of fears: the fear of the paranormal (where all the science fiction thread is developed) and the fear of psychopathic minds, what they’re able to do, and… why not you? Besides this, man, this book is extreme. Honestly, if you’re easily offended, choose another one. This author pushes your limits, has no boundaries. Every single controversial scene is exposed in this piece. It will disturb you, it will curl your stomach and, some of the pages, you will read them trying to close your eyes. But you can’t. Because you want to read it. And you know it. Wyrmwood takes personal care of every character, creating a spectrum of crossed emotions between them that gives birth to a sensorial web, which makes you feel paranoid. He knows what he’s doing at every line, every word. A very, very special book. Sci-fi soaked in extreme horror scenes. I’m positive, science fiction lovers will fall in love with this book, and horror fans will be pleased and satisfied with all the blood and nightmarish material the author offers… for our delight. This is a book to keep. A book to treasure. For us, extreme horror lovers, it’s not easy to find material which content disturbs you. Wyrmwood, does. Grab it, savour it, enjoy it, let it possess you. A truth more depraved, horrifying, and deadly than anyone could have ever imagined… June, 2016, and pretty women are disappearing again. Just like they have been from the pristine Little Madrone River Valley every summer solstice day for the past hundred years. It all started in 1917, when blasting for the hydroelectric powerplant at the headwaters of the river, known by the locals as the Boneyard, uncovered a bizarre cliff of glittering iridescent rare earth metals. Old timers believe there exists some sort of cosmic linkage between the disappearances and the cliff. Others suspect they’re the work of a crazed, multi-generational cult of solstice-worshipping serial killers. The police deny the disappearances are connected. They attribute them to the scourges of modern life: drug addiction, broken families, prostitution, and the shiftings of an increasingly rootless and transient society. Twenty-six women, among them heiress Meredith, horror blogger Cherise, single mother Wendy, and waitress Rebecca, are about to discover the truth. The paperback normally costs $24, but now it’s only for $7.21.